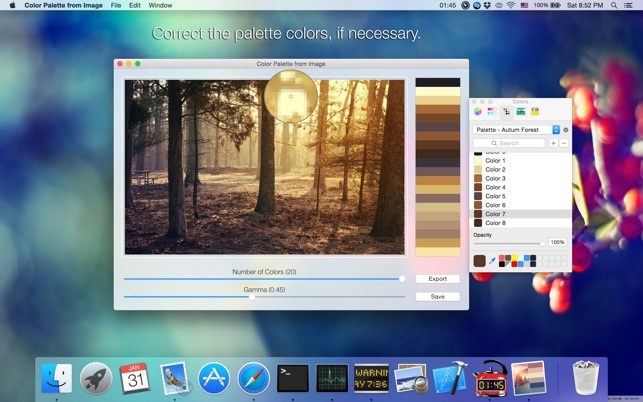 This application allows you to create a color palette from the image. 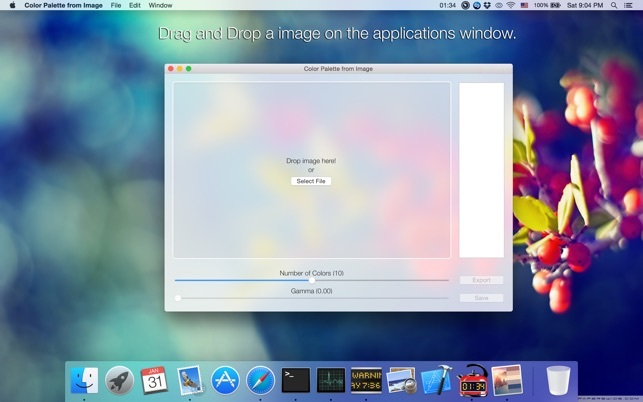 Just drag and drop the image on the window, and save the palette in the Color Panel. 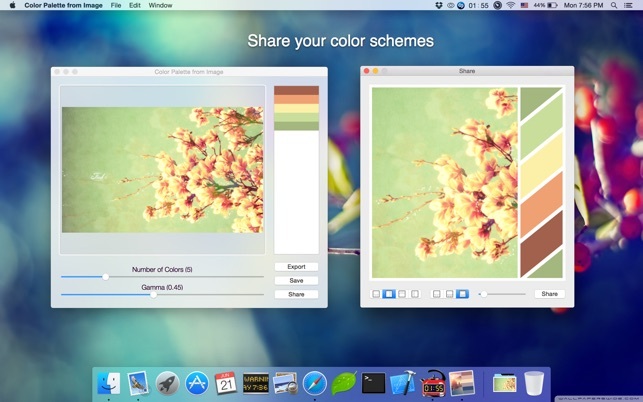 You can to save the color palette to a file and use it on another Mac too. ○ Generates a color palette from images. ○ Adjustment of numbers of colors. ○ Target image area selection. ○ Based on the quantization algorithm. ○ Saving for use in Color Panel. 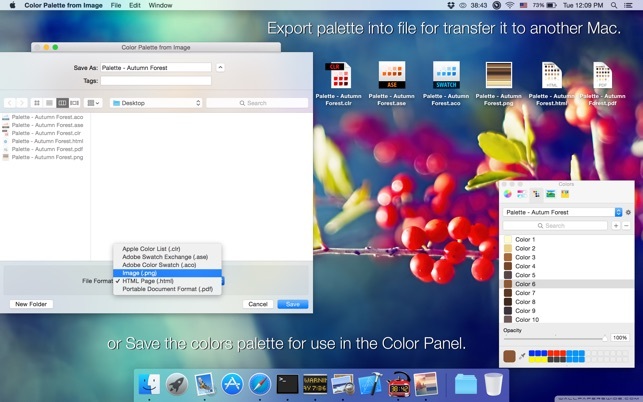 ○ Exporting palettes to file for use on another Mac/PC. ○ Exporting palettes to image files. 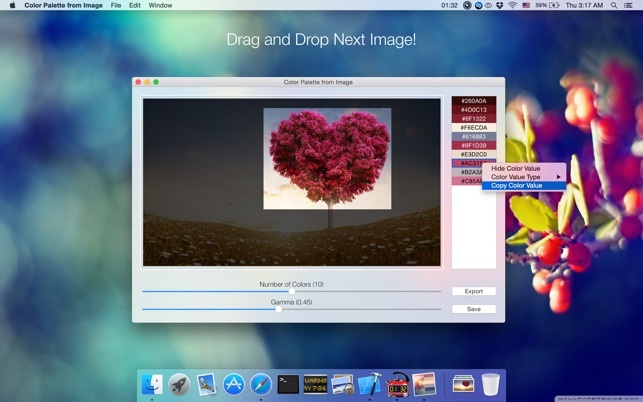 ○ Exporting palettes to PDF and HTML documents. ○ Support "Adobe Swatch Exchange" (.ase) and "Adobe Color Swatch" (.aco) format for export palettes to Photoshop. Fixed saving .aco & .ase files. It was easy to get color palletes from the app and export for various programs but then the app started crashing out for several weeks leaving me with nothing simple to use. Now to get palletes i must wait through a delay or upgrade to pro (which was NOT MENTIONED here on the original app page when downloaded) or upgrade to pro to download the pallete once you wait to view and screen shoot it. I needed something i could export for my other programs and opted for this one with no ads, simple to use, and easy to download. There was NO NOTICE of "in app purchases" like every other app tells you about before hand. Now after waiting several weeks for the app to remain stable I have to pay to use. It is easy to use and useful but after installing for several weeks it will ask you for money, and this is kind of annoying. I work with colors all day long. I purchased this quite some time ago and it was fantastic! I haven’t been able to use it in a long time. Crashes constantly, was never fixed. Will change my review if the developer updates it. Shame, great product and i recommened it to others.